It’s nice to be entering the winding down that always seems to precede Christmas and New Year’s. My book manuscript deadline is looming, so the week ahead will be a fairly productive one (I hope), but I won’t be multitasking, and that’s a relief. I always take pleasure in work that feels deep and focused. The idea of “complete trust” is difficult for me to wrap my mind around, and it always has been. Until recently I’ve assumed that such trust is something that one either has or doesn’t have, and that faith by extension is either wholly present or wholly absent. It’s never really occurred to me that faith–like so many other things in life–might be a practice of sorts, something that’s built up over time. This isn’t to deny or minimize the power of innate trust and conviction, of beliefs that strike us forcefully and stick to us like glue. We all have some of those, I think; for me, veganism is one of them, something that felt deeply and intuitively right from the first moment I perceived it and has felt that way since. It’s so much a part of my worldview now that it no longer registers as a choice. Sometimes, though, faith and conviction don’t feel so effortless. We might want to believe in something, but we find ourselves beset with ambivalence or doubt. We may face sudden confusion or disbelief about an idea or a situation that had previously seemd rock solid. Over time our faith might break apart, opening up space for new ideas, new realities, new feelings. Or maybe faith undergoes a metamorphosis, a period of questioning that results in trust that’s deeper than it was before, precisely because it was tested. This past year has compelled me to call into question many things I’d previously taken for granted, including some seemingly unassailable notions I’ve had about myself and my future. At times it has been an exciting, even inspiring process, but the last few weeks have been particularly bewildering and painful. A few days ago I was feeling panicked at my own disorientation, but this morning, as I sat at home and drafted this post, I felt strangely resolute about the idea of “keeping faith.” Not in the sense of forcing conviction that can’t be feigned, but rather remaining committed to the process of watching things unfold. Maybe nurturing the capacity to sit with uncertainty is a faith unto itself, a gesture of acceptance that bespeaks a sense that things will be as they should be. Reading that over, I’m not at all sure that it makes any sense at all. And I guess that’s fine. It was difficult to pick out this week’s recipe links without gravitating entirely toward vegan holiday cookies, but I did my best to show some restraint (no promises made for next week’s weekend reading post, which falls on Christmas day). In the end, I found some really wonderful, hearty winter food, along with some cool new reads. I hope you enjoy them all. First up, some breakfast/brunch beauty from Lindsey of Dolly and Oatmeal. 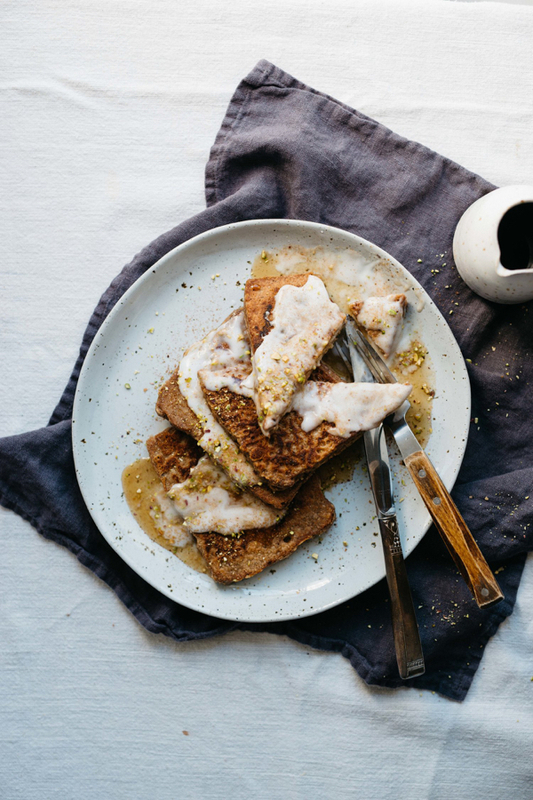 Her vegan gingerbread French toast looks incredible, and I love the use of chickpea flour (which is my own personal favorite way to make French toast without dairy or egg). Looking for a colorful salad to brighten up your holiday table? 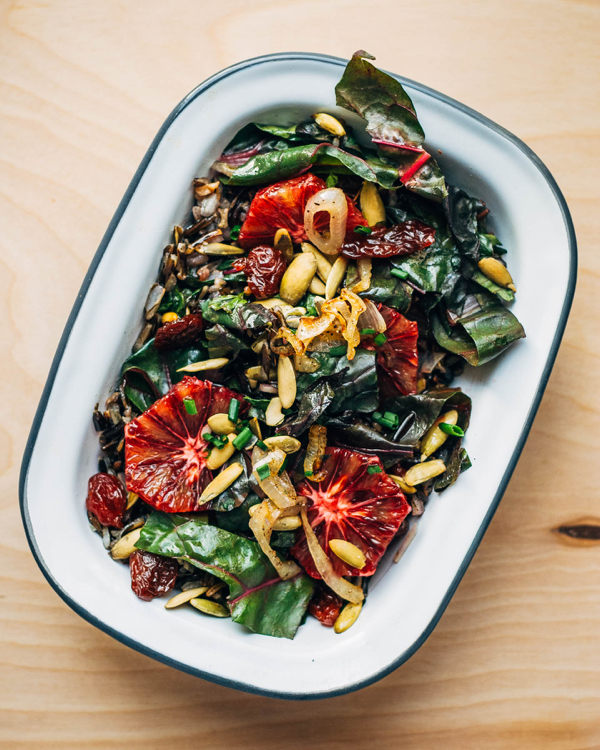 Look no further than Elizabeth’s blood orange, rainbow chard, and wild rice salad. I have to admit that I’m not a huge chard lover (it’s my least favorite leafy green), but this salad is enough to entice me–and I’m also excited to try it with kale. 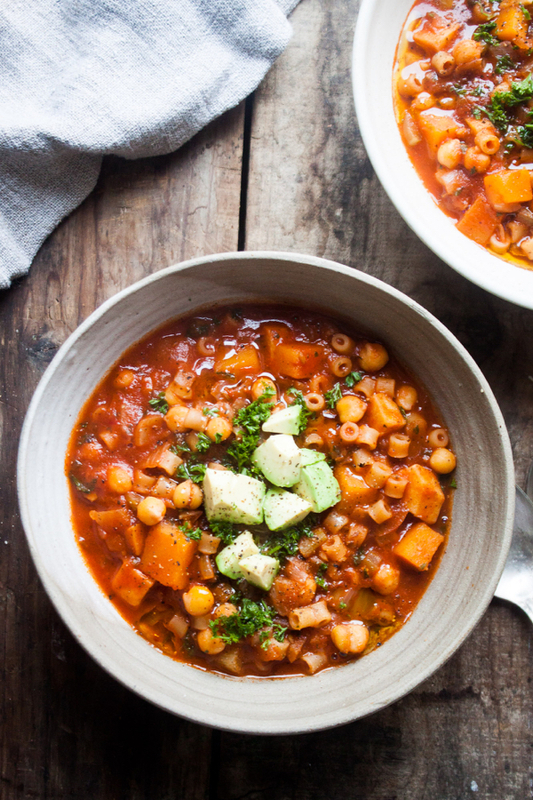 It was in the twenties with howling wind just a few days ago, and I wish I’d had a big batch of Shira’s chickpea minestrone to keep me company! Such a hearty, comforting recipe, and I love texture that chickpeas must add to this classic soup. I haven’t really experimented much with homemade gnocchi, but it’s nice to know that a beautiful vegan rendition can be made with no more than three ingredients. 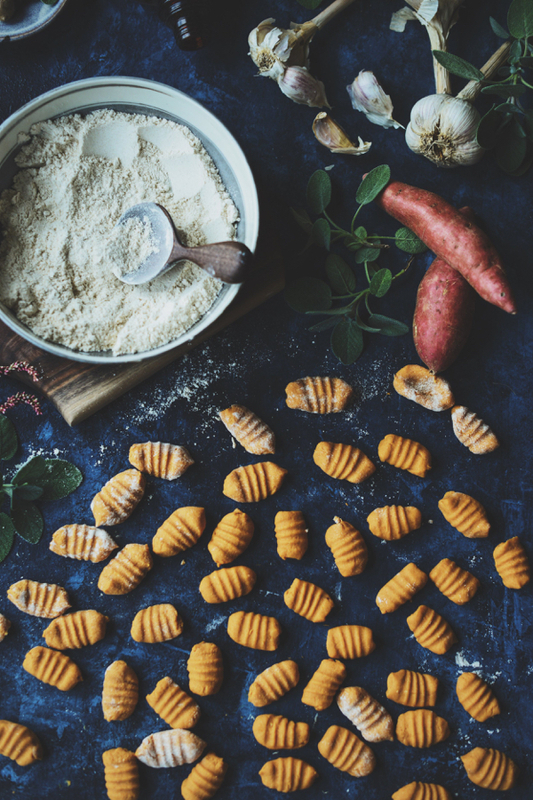 Kaity’s vegan sweet potato gnocchi are easy, pretty, and they look delicious. I couldn’t resist at least one cookie, of course. 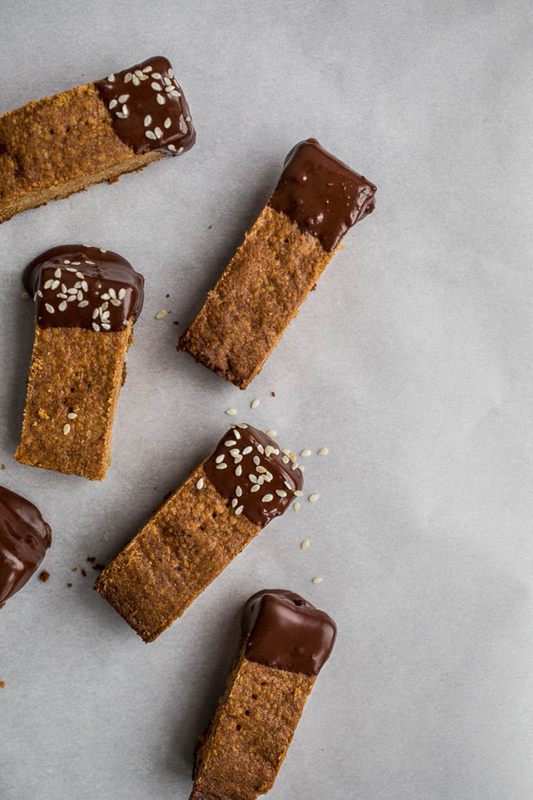 I’m loving Tessa’s chocolate-dipped tahini shortbread, which are gluten-free as well as vegan. Beautiful color, simple recipe, and these would make terrific edible gifts (if you can bear to part with them). 1. One thing I’ve learned in my work with clients is that no two people will respond the same way to the same dietary changes. We all pay lip service to the idea that every body is different, but counseling people through weight loss (or gain) substantiates it vividly. As we enter the time of year in which we’ll all be bombarded with weight loss regimes, diets, detoxes, and eating styles that claim superlative status, I’m glad to see some solid reporting on the incredibly diversity of weight loss/maintenance experience. Gina Kolata’s article makes clear that more and more research is showing obesity/overweight to be the result of many genes acting in concert. Weight loss, then, can’t be as simple as developing a drug with a single target, or a universally endorsed diet. It has to be deeply individualized, which means a lot more close listening and attention paid by doctors and dietitians. 2. If you can tolerate some pangs of heart, it is so worth it to experience Richard Feynman’s sweet letter to his late wife, Arline, as read by Oscar Isaac. I find it hard to understand in my mind what it means to love you after you are dead – but I still want to comfort and take care of you — and I want you to love me and care for me. I want to have problems to discuss with you — I want to do little projects with you. I want to do little projects with you. I can’t think of a more poignant expression of the loneliness and sense of loss that lingers after someone is gone. 3. A few years ago the idea of using an app to vent, to help manage anxiety, or simply to water (virtual) plants might have made me laugh, but this past year has been a humbling journey. Nowadays I don’t discount or disregard any tool that might help a person to feel calmer, more centered, or simply distracted in a pleasant way. 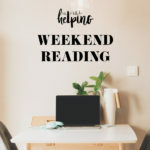 So I loved this roundup of 9 apps that can help with self-care. Some of them are geared toward anxiety management in a very explicit way (for example, the Vent app allows for spontaneous expression of emotion in a safe space), while others are more subtle (the Coffitivity app recreates coffee shop noises, which can be comforting or helpful for those who work alone or from home). They’re all surprisingly thoughtful, and in spite of my skepticism, I’m curious. 4. No big surprise here, but more good coverage of depression in the medical profession, fueled by grueling and dehumanizing training. During my post-bacc I became acquainted with the labeling of certain patients as difficult. Sometimes they were the patients with mysterious ailments, symptoms that defied ordinary diagnoses and therefore frustrated doctors. Sometimes they were patients who were so deep in suffering that they became belligerent or cruel, alienating their caretakers. Sometimes they were patients–like Jim Franklin, whose battle with cancer is described in the article–who were incurable. I knew the radiologist meant that the dirty thumbprints of Jim’s cancer were everywhere. But the way in which he said it made me mad. Jim’s X-ray suggested nothing but hopelessness, but every day I walked into his room and saw someone who was still alive. The radiologist didn’t have to deal with that, but I did. Todd’s essay is succinct, but with only a few anecdotes and spare language, I think she captures something profound about the art of medicine. First, she touches on the fact that healthcare professionals should know how to keep their egos from interfering with the care they give. It’s understandable for a physician to feel frustrated when his or her ministrations can’t prevent suffering or death: doctors are people, too, after all. But the patient is betrayed, and medicine fails, when a sense of ineffectiveness prevents a doctor from giving good or empathetic care. Second, Todd makes clear that doctors and other healthcare professionals have as much to learn from their patients as the patients do from them, and often even more. I have learned so much from each person I’ve worked with, if only because the experience of listening to a person’s story is endlessly surprising and interesting. I hope that I’ll continue to learn from the people I work with, always. And with that, I wish you all a good start to a new week. In a few days I may just have some holiday cookies of my own to share! Your words about faith resonated deeply with me today. Thanks for sharing, because now I know I’m not alone in grappling with these issues. Love the new blog layout! I think most of us find it hard to completely trust because of our expectations and indifference. Thanks for sharing! “Maybe nurturing the capacity to sit with uncertainty is a faith unto itself, a gesture of acceptance that bespeaks a sense that things will be as they should be.” This quote from above makes complete and total sense, and reflects the wisdom and understanding of someone who is truly paying attention. The only way I would alter it for my own understanding would be to end it with “. . . that things are as they should be”. Thank you again for a beautiful post. I love this topic. Going through change while having faith that it will all work out is challenging. Your blog has always resonated with me and I am so grateful for it. Thanks for sharing with all of us. It means so much to me that you feel that way, Kathy. Thank you for sharing. The funny thing, Maria, is that the first thing I thought when I read the essay about Jim Franklin is how much the author’s writing style and way of looking at things reminded me of you. So I’m happy to hear you appreciated it, too. I was amazed at how profound it was, given the brevity and restraint (I have a hard time with not rambling in my writing, so I note and value economy where I see it!). And I am so happy that my thoughts on faith resonate, too. Much, much love. Faith? It’s like when you get on a plane you have faith in the pilot. You have faith in the manufacturer. You have faith in the mechanics. You have faith in the baggage handlers. We all do it many times a day for many things …. should be easy and it is. Think about it! I just wanted to pause and say very happy holidays to you, gena. We met once on thanksgiving at candle 79 and your words gave me hope and peace during my infertility struggles when you were moving away from the med school path. We had that lovely exchange this summer when I let you know I had a healthy baby boy (surprise!) after 4 years and now write to you this Christmas Eve mostly happy, incredibly grateful and frequently exhausted with my 8-month old bundle. Your honesty over these past few months has been refreshing and inspiring to me. Truth be told I’ve been struggling as well even during this incredible time, especially once returning to work full time in September, and have taken a page from your book all autumn about being more honest and open with those around me that I’m not perfect and all is not always great (even sometimes saying “I’m not ok right now” – very scary words for we perfectionists!). 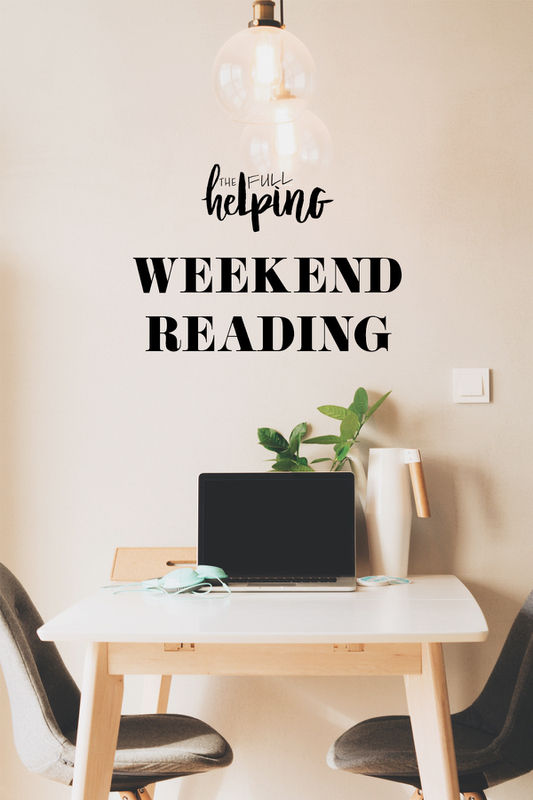 These weekly check-ins from you have become a real touchstone point in my week. More for your words than the links, though I do love those too. And wanted to share I made the tahini shortbread last night (I bookmark every week and so rarely actually make anything). My post baby obsession has been tahini (baby doesn’t tolerate nuts well via nursing) and I’m GF so these are quite the Christmas treat for me! I’m also thrilled to learn of the dolly and oatmeal site – some great stuff. Thank you for continuing to share your life and light with all of us. Wishing you peace, resilience, ease, self compassion and moments of open-mouthed laughter and joy this holiday week.